Ribes punctatum growing shrub‎ of the genus Ribes also known as Punctatum currant, Ribes punctatum perennial deciduous plant, grow in temperate climate and growing in hardiness zone 4-7. Flower color pink, grow in clusters, 5-20+ flowers in cluster. Pink flower, the flowers grow in clusters, 5-20+ flowers in cluster. 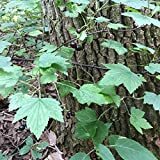 What can be done with big quantities of Ribes punctatum fruits?